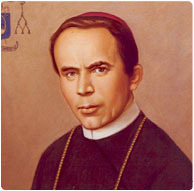 On January 5, 2011, the feast of St. John Neumann, the Redemptorists will open the Neumann Year, which will end on June 23, 2012. Philadelphia Cardinal Justin Rigali will celebrate the opening Mass on the feast day at the saint’s shrine in St. Peter’s Church in Philadelphia. A parish-wide celebration will be held January 9, 2011. For more information about Neumann Year events and how you can join the celebration, visit redemptorists.net/neumann. Download a complete information packet here. Event information for dioceses, parishes and groups available in this brochure. Several events are planned throughout the Neumann Year to share with the world his message of faith, education, and charity. Some activities include monthly Saturday retreats at the Shrine of St. John Neumann, special parish missions and evenings of recollection preached by Redemptorist missionaries in parishes throughout the East Coast, and an essay contest for Catholic middle- and high-school students. “The witness of his life speaks in a particular way to our own age,” said Baltimore Provincial Patrick Woods. “As political battles are waged about undocumented immigrants and our borders, we think of our saint who was a zealous pastor to waves of immigrants.